Maybe it's the cold or a need for deeper, more satisfying, flavors during these cold winter days. Whatever the reason (or maybe for no particular reason at all), I've been craving curries. During the holiday break, I made coconut chicken curry and that really hit the spot. Along the same lines, I thought I'd try a recipe I'd saved up for a while now and make a fish curry. 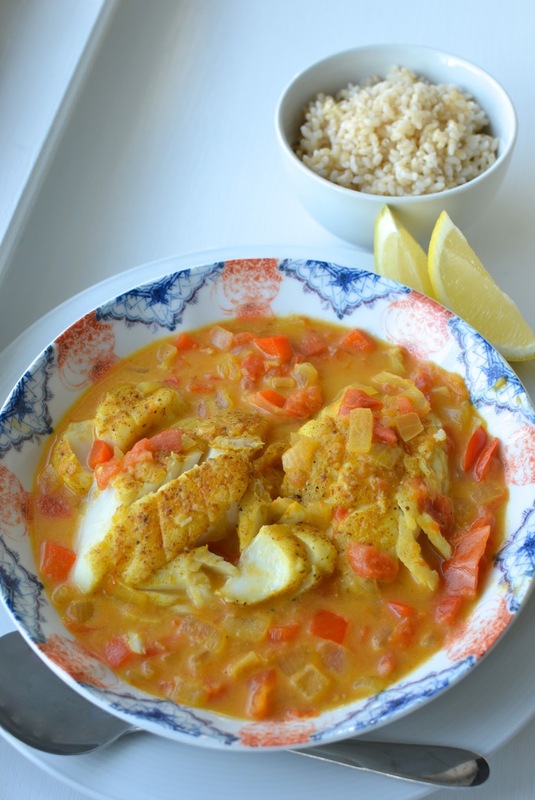 In this case, it's Cod Coconut Curry. I was interested to learn that this is a dish from Tanzania and that many dishes from Tanzania use Indian spices. I pulled this recipe from the April '14 issue of Cooking Light. It's easy to put together and light; I love dishes like this that are full-flavored, healthy, and hearty at the same time. Since I'm always looking to incorporate more fish into our diet, I'm happy to add this to my repertoire. I used cod but any flaky white fish would work nicely (in the recipe, halibut is used). The fish is first rubbed with hot curry powder and then seared and partly cooked on the skillet. Then comes a mixture of onions, red peppers, and some fresh garlic and ginger. Tomatoes break down and their juices help create this broth that's combined with some light coconut milk for a richer flavor. The light coconut milk contributes a tropical note to the dish without being overpowering or making the dish too heavy. The fish finishes cooking in the sauce and it's all done, ready to be served with some extra lemon on the side. I never under-estimate the power of lemon juice; sometimes, it's just what you need to round out the flavors of a dish or to make all the flavors pop, as in this case here. I served this fish curry with some brown rice. It's perfect for soaking up the sauce and makes for a satisfying dinner. This is a great meal for fish and spice/curry lovers. A couple of months ago, I was seeing twice-baked potatoes everywhere. After seeing it in yet another magazine one day, I decided to make a couple for dinner. You could get very creative with the filling but knowing my family, I made classic bacon-cheddar ones with scallions, and those potatoes turned out to be a big hit! So I've been making twice-baked potatoes with some regularity recently. When your little one makes a request for something you cook, you can't help but want to comply. I really shouldn't have been so surprised those potatoes were such a hit. The little guy loves bacon; if you ask him, everything really is better with bacon (particularly, pancakes and eggs). Because of that, I usually have some center cut bacon in the fridge or freezer and a few crispy slices often find their way onto our weekend breakfast table. It always makes me think about my own earlier obsession with bacon-egg sandwiches. In more recent years, I've switched over to ham but I'm getting reacquainted with bacon again. So it was the somewhat-surprising hit of those bacon and cheddar twice-baked potatoes that had me making these biscuits. I figured it was a safe bet that the fellas would enjoy the same flavors in biscuit form and sure enough, I was right! To me, just hearing "biscuits" makes me think something delicious is coming my way. And, well, if you like cheddar cheese and bacon, you know the salty, sharp flavor these biscuits promise to provide. To the mix, I added some sliced scallions. I think cheddar and bacon just begs for something in the onion family to balance it out. I used mild scallions/green onions but whether it be chives, leeks, shallots, or regular onions, I enjoy that combination. Even the little guy enjoys his biscuits (and twice-baked potatoes) with scallions in the mix. I've really been getting familiar with the simple recipes in my Sweet Paul book. These biscuits are another adaptation of a recipe I saw in the book. I turned his morning biscuits with cheddar, dill and pumpkin seeds into this rather more mundane, but still very delicious, cheddar-bacon-scallion rendition. Once you cook the bacon and shred the cheese, the dough is simple to put together. I like baking these biscuits in a muffin tin...you get nice crusty, cheesy edges all round. 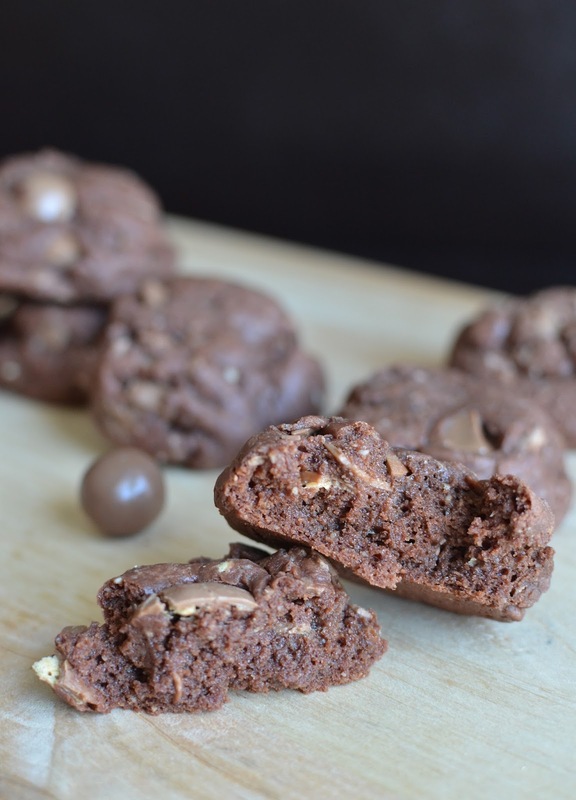 These biscuits are a nice treat to make for Sunday morning breakfast. That's what I did, serving them with some easy-over eggs. Instead of morning biscuits, these would be equally great alongside a bowl of soup or chili, or with a crisp salad. I made chocolate eclairs! I've been wanting to make eclairs for a long time and these were one of my baking projects during the holiday break. It was an interesting experience and I was happy that they ultimately turned out (quite deliciously, but it took two attempts) and we were able to enjoy them with my sister and her family during a relaxing little after-Christmas dinner at our place. Here's the story: Over a year ago, I made pate a choux and used it to make cream puffs and profiteroles. They turned out nicely and I was pretty proud of myself. I wanted to make eclairs next; after all, it's the same dough and all I'd have to do is make pastry cream and either a ganache or chocolate glaze for the topping - things I've done before. But there was something about the idea of making eclairs (and even making cream puffs and profiteroles again) that seemed daunting and I put it off, and off. I was reluctant for some reason...and I may now know why. Maybe we sometimes have a gut feeling about these things. I was worried about something - I thought maybe it was the steps involved or about wielding that piping bag with my naturally shaky hands. Turns out...it was the dough! The dough that should be simplicity to make and involving just a few ingredients. I made the pate a choux dough following the same recipe I used successfully last time and it turned out...watery! I just stared at it, a little shocked because this kind of fail doesn't happen very often. That's not because I'm "good" but because I'm a bit of a control-freak; I know what I like, and I research and pick reliable recipe sources. Well, there was absolutely no way I could pipe the dough that sat in front of me; it was almost as thin as the consistency of soup and ran right through the pastry tip. What did I do? I tried to fix it by placing it in the fridge and giving it some serious whipping with my wooden spoon every so often to see if it would stiffen up. I then remembered that the last time I made the dough for those cream puffs, I'd noted that the dough was thinner than I expected! Looks like I was lucky last time! So while I was awaiting the fate of that watery dough, I started thinking maybe I should use less eggs. But then I looked around some more...and consulted Dorie's latest cookbook (Jo's chouquettes recipe instructions helped me, too) and realized that I needed to cook the dough longer on the stove, on the heat, to remove the liquid from the dough to dry it out! Not doing that was what made the pate a choux runny! I love David Lebovitz, the source for the recipe I used, but the instructions did not cite that. I decided to abandon that first attempt (the dough had thickened some but no where near enough and I didn't hold much hope for it) and make another batch. By cooking the dough on the heat a couple of extra minutes, I had a wonderfully thick dough that was a world of difference from my first attempt! It's a good thing I only sacrificed half a stick of butter and a couple of eggs for the re-do! So that was the little drama behind my eclair-making experience. I feel really good about it after the fact because I learned something! I also no longer feel a weird reluctance at the thought of making eclairs or pate a choux! After all that back story, we can finally talk about these actual eclairs! They were worth the drama because these little eclairs were not only fun to look at but also so easy - and delicious - to eat! As you've clearly seen from all the pictures I threw in as backdrop to my story, I was true to form and went with a chocolate pastry cream for my eclairs. While a vanilla pastry cream would be very good (I might try that), I can never get enough chocolate and that's just a plain fact for me. Topped with chocolate ganache, I decided to sprinkle some of the eclairs with pistachios after Nigella reminded me that any cake becomes instantly more beautiful garnished with it. I think she's right and the same goes for eclairs. Interestingly enough, I think the eclairs tasted all the better with that bit of crunch and flavor! My little batch of chocolate eclairs disappeared quickly at the dinner table that night I served them...and there is no better feeling! I got a new toy for Christmas. I've wanted a kitchen blow torch for years but always talked myself out of it. I couldn't quite justify another gadget that I'd rarely use. But I couldn't resist putting it on my Christmas list this year, and Santa delivered! So, of course, I had to make crème brûlée! I made two kinds - the first being a classic vanilla crème brûlée. I'm always happy to make and taste anything showcasing eggs. If I had to pick a favorite ingredient to cook with, eggs would be it. 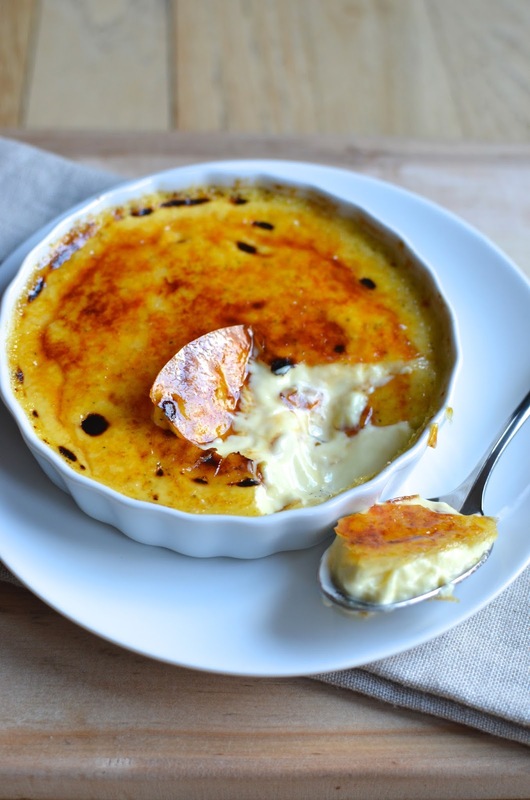 I love egg custards, and crème brûlée is like its glitzy, glamorous, rich cousin. Thanks to my new kitchen blow torch, I can get that signature thin layer of hard, almost bittersweet, caramel on top of the cool, creamy, eggy, sweet vanilla custard. It is an easy thing to love! And with that kitchen torch, crème brûlée is a magical little dessert that's actually really easy to conjure up. Cook the custard ahead of time since it needs to chill and keep it in the refrigerator until time to serve when the theatrics begin and you can shower the top with sugar and turn that torch on! For my custard, I used half heavy cream and half milk. The crème brûlée was plenty rich and utterly delicious with flecks of vanilla beans running through every bite. That was the classic...and now let's chat about the second rendition I made: green tea crème brûlée. I had a green tea (or matcha) crème brûlée once well over ten years ago that I loved so much, it stayed with me all this time. So I knew that if ever I got that kitchen blow torch and made crème brûlée, I'd have to try a green tea version. Once upon a time, I worked in finance as an investment research associate. Every so often, we would go on roadshow presentations - lunches hosted by companies looking to hold an offering, selling company stock to raise funds. I'd be sitting there, listening and taking copious notes (fun times) that I'd need to turn into reports and such. At least these meetings came with a good meal. One time, I was at the Mandarin Oriental hotel in New York City for one of these roadshows and while I don't remember any other specifics about that day, I do remember the most delicious green tea crème brûlée served for dessert. I was really surprised by how good it was and that's why I've thought about green tea crème brûlée for years. That's my little story. And really, the green tea version is so good. I suppose that slightly bitter, grassy note to the tea gets mellowed by the sweet custard and there's a nice balancing effect happening. The green tea crème brûlée did not disappoint and lived up to the hype I had in my mind from that one experience. My husband and I enjoyed both the vanilla and green tea crème brûlée together and we tried to decide which we liked best. There was a lot of oohing and aahing in general and I think we remain undecided. The vanilla is such a classic - thoroughly sweet. Ironically, though the green tea tastes less sweet, there's actually a bit more sugar in it than the vanilla. Both are divine and I'm really glad I decided to finally ask Santa for my little kitchen torch. It's 2015 and time for the first post of a whole new year. I hope you had a wonderful holiday break! The last couple of weeks have been wonderfully relaxing. My husband took a holiday from work (the little guy was in heaven spending so much time with dad at home) and we loved the quiet time spent hanging out together. I cooked a ton and got to try out a few new recipes. Being able to sit down together a few times a day to enjoy a hot meal around the table was a real treat. Those are the moments I treasure the most and I hope there are many more in the years ahead. One of the recipes I got to try out during Christmas vacation was this quiche. I am talking about a quiche with a quinoa crust!! Talk about genius! The idea/recipe popped out at me from the December 2014 issue of Cooking Light and as someone who's always looking for ways to eat healthier yet still deliciously (as well as a fan of quinoa), I knew I had to try it. I know the trend is to lighten up in January. That's sometimes a necessity after the holidays but I have realized that I am just not into dieting. I don't like gorging one day only to deprive myself the next (I speak from experience). So I try not to approach January with a sense of repentance for my December indulgences. I try to maintain a year-round eating philosophy of balance - eating plenty of healthy, whole foods and also savoring my sweets because dessert makes me happy and sweeten my life in more ways than one! To that end, I tried to "indulge responsibly" during the holiday season, and I think I did pretty well. But of course, the emphasis is always on "trying" and in general, I think it's good to remind yourself not to be too uptight about it one way or the other. So I don't think of a recipe like this lighter quiche as "diet food". I think it's just a smart way to eat. You swap out the rich, buttery crust that you typically expect with a quiche for this hearty fiber-full quinoa crust that's built on just quinoa and an egg as binder (along with some seasoning). It acts as a great foundation for whatever you wish to fill your quiche with. That's the beauty of a quiche or a frittata - the filling options are endless and infinitely customizable. I built on the Cooking Light recipe, starting with spinach and onions and adding some mushrooms. You can keep your quiche vegetarian or add some meat, like I did with a little ham. I couldn't help but think that just a little bit of cooked chicken sausage would be great if you're looking for something a bit more substantial. Instead of feta cheese, I used some parmesan cheese in my quiche. And with just half a cup of 1% milk, a few eggs and egg whites to pull everything together, I had a flavorful quiche that didn't weigh me down at all. 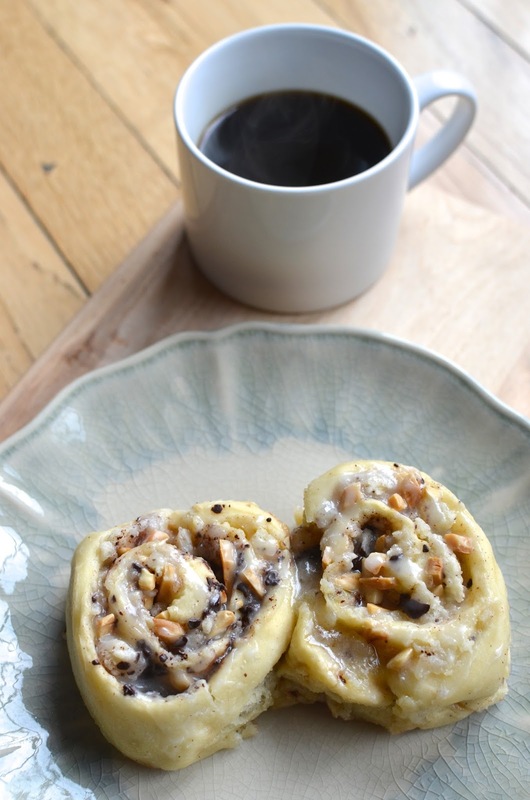 This is great for breakfast, lunch (brunch), or dinner, and leftovers rewarmed quite well.